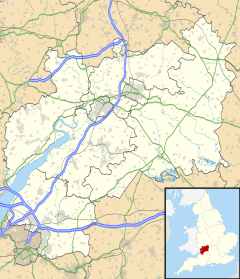 Upper Rissington is a village and civil parish in the Cotswold district of Gloucestershire, England. It is located about two-and-a-half miles east of Bourton-on-the-Water and is one of the highest villages in the Cotswolds at an elevation of 275 m. The village is on the former site of the Central Flying School and the airfield is still the active RAF site of RAF Little Rissington. Some of its housing was built as officers' quarters from the 1930s to the 1950s. These were sold by the Ministry of Defence in 1996 to developers, who modernised the properties and sold them on. The street names give a clue to the village's former life, having names such as Sopwith Road and Avro Road. The village has since been greatly expanded with many new houses built on the site of the old RAF hangars and ancillary buildings. Several of the buildings of architectural importance such as the Station HQ and the Officers Mess have been retained and converted into housing. The village is enhanced by the large numbers of mature trees planted by the first Station Commander which are now all protected. Local churches have come together to start Cur:Ve a Christian group in the village focused on building the new community as well as introducing people to Jesus. Cur:Ve employ a full time worker focused on starting community activities such as sports and children's groups. A mini shopping mall has been constructed as part of the new development which includes a MidCounties Co-operative Society shop, Badham's Pharmacy, The Hangar café, Runner Bean gym and a Barnado's charity shop. There is also a village hall, a primary school, tennis courts, football pitches and many green spaces around the village. The village is within the catchment of the Cotswold School "the Comprehensive School of the Year 2015/16" according to the Sunday Times. The village has its own Parish Council. The village is the most populous area of the 'Rissingtons' district council electoral ward. This ward starts in the south at Great Rissington and stretches north to Icomb. The total population taken at the 2011 census was 2,103. The village is in the Stow-on-the-Wold county council electoral division and is one of the three largest population centres, along with Stow and Moreton-in-Marsh. ^ Ordnance Survey: Landranger map sheet 163 Cheltenham & Cirencester (Stow-on-the-Wold) (Map). Ordnance Survey. 2012. ISBN 9780319229125. ^ a b "Gloucestershire Parish Profiles". 2016. ^ "Sunday Times Comprehensive of the Year". cotswold-homes.com. Retrieved 27 July 2016. ^ "Rissingtons ward 2011". Retrieved 24 July 2015. This page was last edited on 29 January 2019, at 05:00 (UTC).